Warning: Deviation from listed pathways may jeopardize participation in the IB Diploma Programme. 1) Has the student had more than 2 years of classroom based instruction in the language? 2) Does the student speak the language at home on a regular basis? services or other bilingual people? 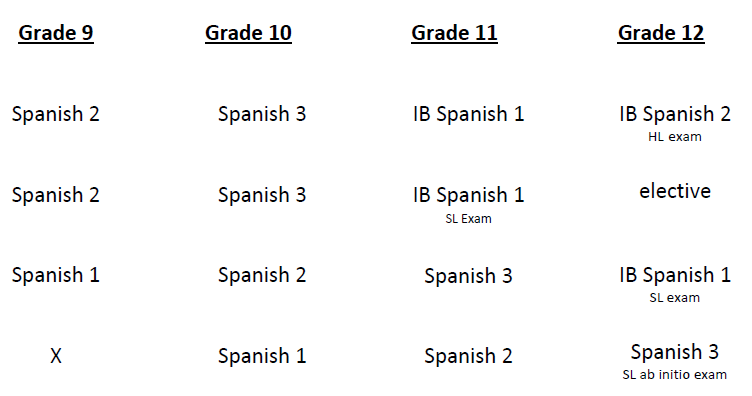 If you answered "yes" to any of these questions AND you plan to take any IB level Language B courses, it would be more appropriate to enroll in a different world language in order to complete the IB course in the spirit in which it was designed. Because every student's experience is unique please do not hesitate to contact your student's world language teacher, your school counselor, and/or the IB Diploma Coordinator at Skyline High School to help assist you in finding the best possible placement for your student.